more on Wannsee Conference, (1942) in which Heydrich laid out the plans for the Holocaust, ordered by the madman Hitler. 2. Nacht und Nebel (Night & Fog) Decree (Dec 7, 1941) coupled with the beginning of gas operations at Chelmno, Poland. (Dec 8, 1941) and Hitler’s declaration of war on the USA. 3. Himmler, Poznan speech on the Holocaust. He often used ‘Jews ‘and ‘partisans’ as interchangeable words. (1943) This occurred after “Action Reinhardt“, or the killing of the Jews of the “General Gouvernement” of Poland was completed. Over one and a half million Jews died during this period in a number of camps in Poland. This is an amazing Article on the engineers of Auschwitz birkenau. Topf and sons. Martin Sandberger, Chief of Security Police, was involved in Holocaust in Latvia, his sworn testimony. For his crimes he was sentenced to life, but was released in 1958 (he served under 10 years). He may still be alive, but he would be about 99 years old. “Q. You collected these Jews, according to the basic order, didn’t you, the Hitler Order? Q. And then they were shot; they were shot; isn’t that right? “A. Yes.” On “Hitler’s Orders”, he states. 6. Hitler’s European Helpers (hiwis). These are the Baltic and E. European murderers who helped Hitler. *Mauthausen, gas chamber. Mauthausen was used as was as “Hartheim”, which is where the Nazis gassed the disabled and retarded, and others. I notice deniers don’t want to talk about euthanasia that also took place at Hartheim, Hadamar and gas vans. ** It is claimed that up to 31,000 were gassed at Mauthausen and Hartheim during the final years of the war. Dr Goebbels’ diary. This shows exact quotations that he knew that the Holocaust occurred and was responsible for it, in part. To me , this is the most damning evidence. Regarding the Jewish question, the Fuehrer is determined to clean the table. He prophesized that should the Jews once again bring about a world war, they would be annihilated. These were no empty words. The world war has come, therefore the annihilation of the Jews has to be its inevitable consequence. The question has to be examined without any sentimentality. We are not here to pity Jews, but to have pity for our own German people. If the German people have sacrificed about 160,000 dead in the battles in the east, the instigators of this bloody conflict will have to pay for it with their lives. Source: Kaye, Ephraim. Desecraters of Memory: Confronting Holocaust Denial. Yad Vahsem — International School of Holocaust Studies, Jerusalem (1997). Holocaust in the Balkans aka Yugoslavia and Greece 1943-4. Accused Nazi Kurt Waldheim was present in the area during the commission of these crimes. He served as an ‘Intelligence Officer’ on the Partisans. Jasenovac camp in Croatia where they estimate 8-20,000 Jews died. more on Auschwitz -Birkenau camp. I don’t believe enough is spoken about Birkenau’s role in the process. Raul Hilberg estimated 5.1 million Jews died, but he didn’t count the nations of the former Soviet Union due to the Cold War being on. So it is well OVER six million! The Holocaust was horrendous, and on a bigger scale than anyone can comprehend. The Commandant at Auschwitz-Birkenau was not allowed to register and keep accurate figures on how many people were gassed, but it is estimated at 1.1 million at A-B. Eichmann reported to Himmler that Six million Jews were killed altogether – and this was in 1944! The war went on till May 8, 1945. 14. Gassings and euthanasia of the mentally ill at Hadamar.﻿ I notice deniers don’t talk about this too much. It shows that even the Vatican spoke out on the issue. December 1940: The Vatican condemns Nazi “mercy killings” of “unfit Aryans” as “contrary to both natural and divine law.” This was the staff who later went on to complete the Holocaust. This is proof that hasn’t been generally shown to be relevant. I put more about this in the ‘comments’ section here. HADAMAR WAS LOCATED IN WEST GERMANY! GASSINGS TOOK PLACE IN GERMANY PROPER! A review of Daniel Goldhagen’s book, Hitler’s Willing Executioners, which is about the “Hiwis” and the “SS” and “Police”; and some criticism of it. Controversial Hunter College Professor Norman Finkelstein attacked it, but I think the book had a lot of merit. It showed how the propaganda worked on people, and how the ordinary Policemen and the Wehrmacht cooperated. Where the book was criticized was in failing to note that there were elements of compulsion and also some resistance in society that was too small to be effective. 16. NARRATED BY ALFRED HITCHCOCK, the camp liberated is I believe “BERGEN-BELSEN” . Extremely shocking footage. This film is about 45 minutes long, and is extremely distressing. Well. There you have it. Sixteen damning pieces of evidence, footage and testimony, and some supporting material. I have more plastered in the comments sections, but there is so much evidence I cannot organize it all. I just wanted people to take a look at some of the evidence. This entry was posted on 07/25/2009 at 6:20 am and is filed under Goebbels, Hadamar, Hitler, Holocaust, Jews, majdanek, National Socialism, Nazi, Nazis, sobibor, World War Two. You can follow any responses to this entry through the RSS 2.0 feed. You can leave a response, or trackback from your own site. Karl Frenzel, one of the mean at Sobibor and other camps who did gassings and burnings. A few persons though, noted throughout that time, that the new Regime was not in accord with basic Christian and Catholic principles, and Catholic leaders such as Preysing, the Bishop of Berlin and Galen, stood against Nazi Racial Policies from the beginning, while others such as Faulhaber from Munich, supported and even hosted gala birthday parties for Hitler. US interrogations of the Doctors involved at Hadamar. Now how is it that the Vatican spoke out on something that ‘never happened’, and that led to the euthanasia program ending? Another letter from Heydrich, translated. “In an August 1944 communiqué to Heinrich Himmler, Eichmann estimated that the SS had killed about six million Jews. Later this letter would be presented as damning evidence at his trial. 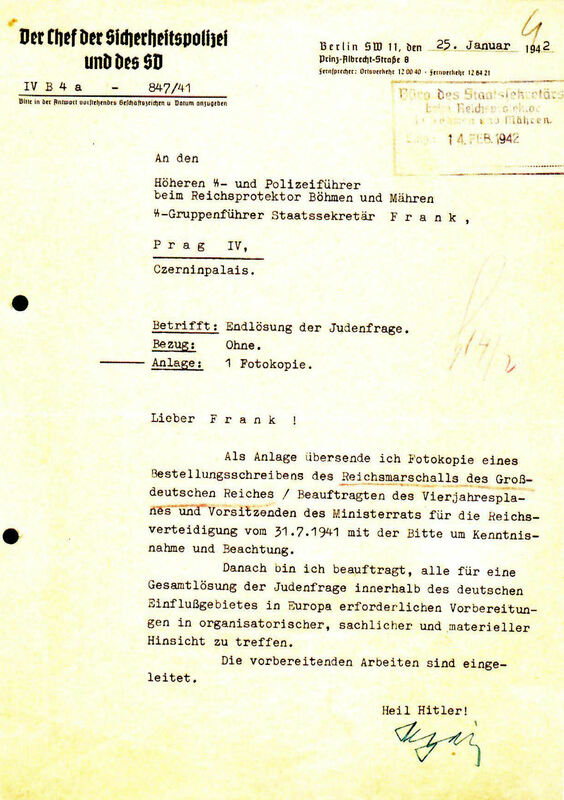 Heydrich’s letter to Frank about die Gesamtlosung des Judens, the Final solution to the Jewish problem. Unfortunately I do not have a translation, but you can find the original document somewhere else. This Is Goering’s letter to Heydrich, 7-31-41. I suggest you actually read it. SS Walther Rauff invented the ‘gas van’. They piped exhaust into the back of a van and killed a group of people. Longerich, Peter. The Unwritten Order Hitler’s Role in The Final Solution, Tempus Publishing Limited, Stroud, 2003.